DIY concrete patio is the best way to save on your cement patios or Concrete patio designs. Concrete patio ideas presented below will help you plan your concrete patio slab so that your diy project is more manageable and don’t strain your budget and time. The key to the success of any diy project is the size, you don't want to tackle something too big that will end up costing you more money and time. For instance, if you want a 12ft x 25 ft patio, plan on dividing it into series of smaller concrete patios that are 5ft x 6 ft. Figure 21 provides 3 different designs that can be easily subdivided into smaller sections manageable for diy-ers. 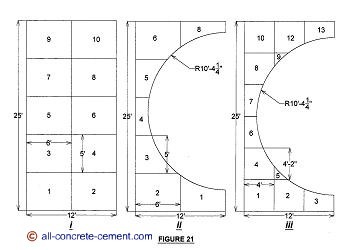 The numbers within the boxes represent different pours or series of cement patios. The lines that divide the pours represent beginning and end of each concrete patio slab. This is a much smaller scale of how floor slabs in commercial structures are done. For a building 200ft x 300 ft, slabs has to be poured in sections. At the end when all the pieces are poured the cold joints where two different pours meet become control joints or expansion joints. By subdividing the pours, one has the freedom to spread the work over a period of time which is ideal for diyers with minimum resources. If funds are not readily available, rather than making loans that will burden you with payments and interest rates for years, only do the portions when funds are available. Each 5 ft x 6 ft or 4 ft x 4 ft pour can easily be an evening after work project which makes it much easier to handle. This type of arrangement will allow you to work at your own pace, manage your funds wisely, and no hassle from contractor.